A reflection of patrons at the former Friendly’s restaurant in Brunswick is seen in October 2011. At that time the company had already closed 63 of its stores. A sign posted Monday morning on Friendly’s restaurant in Augusta said that it had closed, though the restaurant chain’s two other Maine locations remain open. In an April 8 letter to franchisees, Friendly’s CEO George Michel said the company would close 23 corporate-owned restaurants, effective immediately. The Augusta site was one of those restaurants. 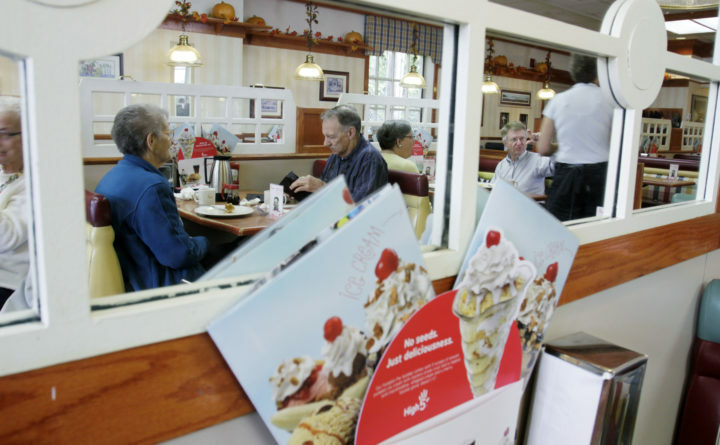 Friendly’s shops in Windham and South Portland, the chain’s other Maine locations, opened as usual Monday. The closed locations include 14 restaurants in upstate New York, three in Massachusetts, three in Connecticut, two in New Hampshire and the one in Maine. Following the closures, Friendly’s will have 77 corporate-owned restaurants and 97 franchisee-owned restaurants. In the letter, Michel said that as the company moves into the second quarter of 2019, Friendly’s is accelerating efforts to reinvigorate its brand. He said it is facing shifting demographics and consumer preferences, increased competition and rising costs. “Amidst these industry-wide dynamics, our charge is to ensure our beloved brand not only remains relevant with existing audiences but continues to resonate with new generations of patrons and that our operations are structured to support long-term sustainability,” he wrote. Michel said the restaurant plans to refresh its menu, focus on delivery and catering options, and improve the overall restaurant experience for customers. The radio station 92Moose.fm reported the Augusta closure, including an image of the sign that greeted employees. The station said employees were not previously made aware of the closings. However, a spokeswoman for Friendly’s said the employees were informed personally, and not via a sign, and that the company is working to support them with opportunities at other locations, severance pay or other assistance. For decades, the shop on Western Avenue in Augusta had been a popular spot for casual dining and ice cream treats. Lawmakers, state workers and students frequented the restaurant, which served as a symbol of stability as other chains or locally owned eateries near the State House opened and closed. Friendly’s was founded in 1935 at the height of the Great Depression by brothers Prestley and Curtis Blake in Springfield, Massachusetts. Its recent bumpy ride began in October 2011, when it filed for Chapter 11 bankruptcy protection. Since then, the chain has closed more than 100 restaurants. Sun Capital also owns Boston Market, Smokey Bones and Johnny Rockets restaurants. The two Johnny Rockets restaurants in Maine are in Freeport and at the Maine Mall.